Home » Council Watch » Ontario: You can save the world’s purest groundwater – again! Ontario: You can save the world’s purest groundwater – again! Water protectors gather at Teedon Pit entrance. Thank you to the Council of Canadians and regional organizer Mark Calzavera for rallying their province-wide network of supporters to the defence of our water. Click here to sign the COC letter to Ontario Minister of Natural Resources and Forestry John Yakabuski. You can send this one or the sample letter we previously posted for the Friends of the Waverley Uplands, or write in your own words. The deadline for comment on the Teedon Pit expansion is March 25 2019. Thanks for your support! Now the Ontario Ministry of Natural Resources and Forestry is accepting comments on a proposal by Dufferin Aggregates to expand its gravel pit (the Teedon Pit), located in the heart of the recharge area for this precious aquifer. Expanding the Teedon Pit would mean cutting down the trees, stripping away the soil and then gouging out the gravel and sand that together make up the “filter” that keeps the groundwater so pure. Dufferin Aggregates intends to store construction materials on the site – increasing the risk of contamination to the aquifer. The company is also seeking a permit to extract millions of litres of water every day in order to wash the gravel on site. It’s urgent that you act now to stop this from happening. Will you tell the Ontario government to reject the expansion of the Teedon Pit and order its closure to protect this critical aquifer? The Teedon Pit is located on the traditional lands of the Anishinabe people of Beausoleil First Nation. Dufferin Aggregates and the provincial government are both required by law to fully consult them about this project, but have not done so. The aggregate industry has long had a free reign in Ontario. The regulations governing quarries and gravel pits are badly skewed in favour of the industry and communities have little influence in the approvals process. But when we all pull together, we can stop the worst of them. 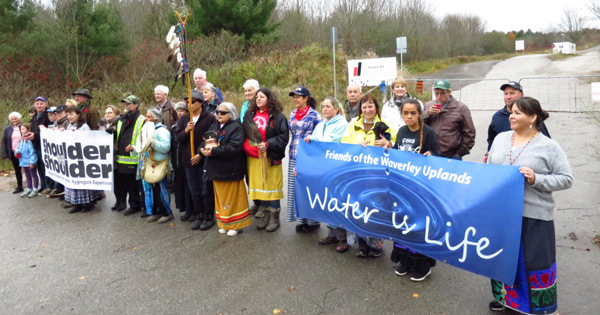 In 2009, the Council of Canadians worked together with thousands of supporters like you from across Ontario, the local community and Anishnabe Kwei from the nearby Beausoleil First Nation to successfully stop the construction of Site 41, a garbage dump that was being built on the same aquifer, located just west of the Teedon Pit. And just a few years ago, Council of Canadians supporters like you helped to stop the proposed megaquarry near Shelburne, ON which would have destroyed thousands of hectares of prime farmland as well as the headwaters of several important rivers. Can I count on you to take a few minutes of your time to tell the Ontario government to reject the expansion of the Teedon Pit and order its closure to protect this critical aquifer?